Plan of the City of New York, with the recent and intended Improvements, Drawn from actual survey by William Bridges City Surveyor; AD 1807. An interesting and unusual map, this is William Bridges' 1807 revival or the failed 1801 Mangin-Goerck Plan. Those who know New York's shoreline will pause at the perfect blocks and ridged angles of this plan no more accurate today than it was in 1801 when Mangin first presented it. 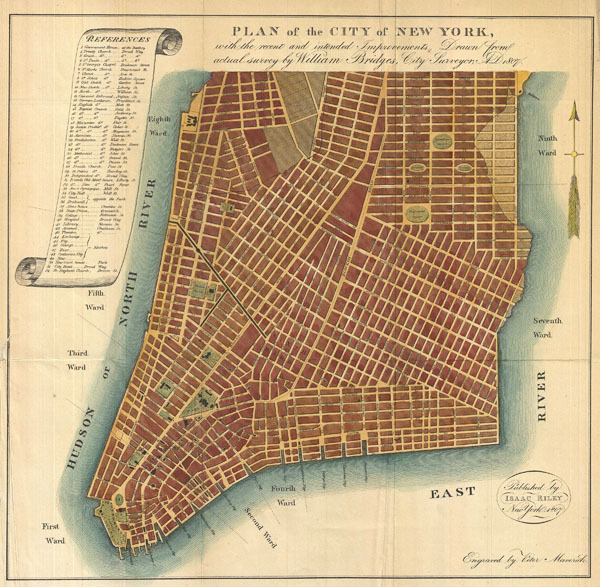 Mangin, a talented French architect, and Goerck, an established New York Surveyor, were commissioned by the Common Council of New York to prepare a new regulatory map of the city. Though Goerck passed away before the plan could be completed, Mangin finished the plan on a grand scale, re-envisioning New York City in his own image. Mangin even added streets such as Mangin Street and Goerck Street which would have been submerged under the East River had they actually existed (as a side note another of Mangin's Street's, South Street, did eventually appear). The Mangin-Goerck plan went far beyond the Common Council's dreams of an administrative plan and, due to its inclusion of 'intended improvements,' new streets, and idealized block structure, enjoyed a short lifespan. It is curious then that in 1807 William Bridges, the talented City Surveyor who, in 1811, laid New York's famous grid structure, resurrected and pirated the Mangin-Goerck Plan, attaching his own name to it. It was a private venture that led Bridges to piracy. He was commissioned by Dr. Samuel Mitchell to provide a map to illustrate Mitchell's Picture of New York, a travel guide intended for foreign tourist. Perhaps Bridges chose the Mangin plan simply because, as a failed city plan, there were few obstacles to his use of it, but we do pity the hapless tourists who leapt into the east river in pursuit of Mangin Street. Though originally issued in 1807 for S. Mitchell's Picture of New York, this example is a reissue prepared by John Hardy, Clerk of the Common Council, for the 1871 edition of the Manual of the Corporation of New York. William Bridges (fl. c. 1800 - 1820) was a surveyor and cartographer active in New York City early in the 19th century. Bridges is best known for his publication of New York City's grid structure in his important 1811 Commissioner's Plan of New York. The Commissioner's Plan is considered to be "the single most important document in New York City's development (Augustyn & Cohen). Unfortunately Bridges had little to do with the actual construction of the Commissioner's plan having stolen credit for the work from the actual surveyor, John Randel. Though today Randel is credited for the Commissioner's Plan, it was Bridges who profited on the original issue and successfully held the copyright. In 1807, Bridges also pirated the Mangin-Goerck Plan of New York City, attaching his own name to it as the "Bridges Plan", and publishing it in a Tourist Guide. Perhaps if Bridges had spent more time surveying than absconding with the work of others, he would have realized that the Mangin-Goerck Plan represented a speculative New York City of the future. It had streets that did not exists and a fanciful block structure that no doubt confounded any tourist's foolish enough to buy it. John Hardy (September 19, 1835 - December 9, 1913) was born in Scotland on September 19, 1835. At four he, along with his parents, immigrated to the United States and settled in New York City. There he attended public schools and in 1853 graduated from the College of the City of New York, where he studied law. In 1861 he was admitted to the New York Bar and in the same year took a seat on the New York State Assembly. He later was elected to the Board of Alderman of New York City and held this post, on and off, from 1863 to 1869. In 1870 and again in 1871 he held the position of Clerk of the Common Council of New York City. In this position, like Valentine and Shannon before him, he published an annual Manual of the Corporation of the City of New York, which detailed the events of the year, Common Council minutes, offered an assortment of maps, and included political and historical notes on the city. Late, in 1877, he became the Chief Clerk to the Mayor and in 1881 was elected on the Democratic ticket to the United States Congress, a position he held until 1885. He died on December 9, 1913 and is interred in Greenwood Cemetery, Brooklyn. Hardy, John, Manual of the Corporation of the City of New York, 1871. Also in: Mitchell, S. L., The Picture of New-York, or The Traveller's Guide, 1807. Very good. Minor discolorations along and verso reinforcement original fold lines. Haskel, D. C., Manhattan Maps, A Co-operative List, 644-45.